*Thanks to my friend Christine for introducing me to Glay's music! You've got taste! *Arigatou to Takuro for writing and composing my favorite Glay songs! And of course thanks to Glay in general for getting me excited about listening to music again. *Thanks to every Glay site out there for helping me learn about and understand this wonderful band! Many of the images on this page were contributed by friends, but if you feel there's anything that belongs to you or needs to get credit for, please let me know. All screen caps were made by me, the webmistress. 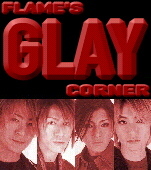 *Thanks to 'The Japanese Channel' for some of the beautiful Glay pictures used on this page. *Special thanks to Cherie from 'A Tribute to Glay' for always being so sweet, for her great site, and for inspiring me to work on my own Glay corner!